The Diamondbacks' scoring cornucopia sends them to the NL Division Series against the Dodgers, starting on Friday in Los Angeles, and Colorado back to Denver. The Arizona Diamondbacks players celebrate after defeating the Colorado Rockies 11-8 in the MLB National League wildcard playoff game at Chase Field in Phoenix, Arizona, on October 4, 2017. The Colorado Rockies had been resilient all season, scraping their way into the Major League Baseball postseason after the best start in franchise history fizzled. The Rockies were able to summon some of that resolve again in the National League wildcard, but never could fully dig their way out of an early hole in a wild, 8-11 loss to the Arizona Diamondbacks on Wednesday. The Rockies had an up-and-down regular season and their first playoff appearance since 2009 followed suit. Colorado fell behind 0-6, roughed up one of baseball's best pitchers and rallied to pull within one twice. The Diamondbacks had to dig deep down in their bag of scoring tricks to beat the Rockies, needing two homers, 17 hits, an RBI bunt single by a catcher and the first run-scoring triple by a relief pitcher in big league history. The Diamondbacks' scoring cornucopia sends them to the NL Division Series against the Dodgers, starting Friday in Los Angeles, and Colorado back to Denver. The Rockies opened the season 44-26, but had to play some tense games down the stretch after faltering the second half of the season. They made it, finishing 87-75 and a game ahead of Milwaukee for the final NL wildcard spot to earn their first postseason game in eight years. For the playoff game between NL West rivals, Colorado had hot right-hander Jon Gray on the mound with a lineup that included a pair of NL MVP contenders, Nolan Arenado and NL batting champion Charlie Blackmon. Carlos Gonzalez also had rounded into form after struggling much of the season, finding his stroke just before the playoffs in what could be his final season in the Mile High City. Their hopes of advancing appeared to end quickly as Gray struggled locating pitches in the shortest postseason start in franchise history. Paul Goldschmidt ended his 0-for-11 career streak against him with a three-run homer in the first inning and Daniel Descalso added a two-run shot off Tyler Anderson, putting Arizona up 6-0 before the Rockies could record nine outs. But Colorado has 10 players with postseason experience and found ways to fight back all year. After struggling against Arizona ace Zack Greinke early, the Rockies chased him with a four-run fourth inning and cut the lead to 6-5 on a groundout in the seventh. Colorado found itself in a hole again in the bottom half, when reliever Archie Bradley, a career .098 hitter, became the first reliever to hit a postseason triple, driving in two runs to put the Diamondbacks up 8-5. Again, the Rockies tried to answer and, no surprise, it was Arenado that started it. Colorado's third baseman had an MVP-type season, hitting .309 with 37 homers and 130 RBIs to become the eighth player in major league history with at least three straight seasons with 35 homers and 130 RBIs. He hit .377 in September and in the wildcard game hit a ball deep to center for a solo homer in the seventh inning off Bradley. Trevor Story followed with a homer in the next at-bat, pulling the Rockies within 8-7. But that was it. AJ Pollock hit a two-run triple and catcher Jeff Mathis dropped a bunt single to put Arizona up four runs. Blackmon went 0 for 4 to close out a spectacular season that had him in the MVP conversation as well. He was the NL batting champion at .331 and had a majors-high 213 hits. Blackmon set major league records as a leadoff man with 103 RBIs and 383 total bases, while his 37 homers and 86 extra-base were third-most from the leadoff spot. Gonzalez finished the regular season hitting .262 with 14 homers in 57 RBIs, well off his numbers in previous seasons. He's at the end of a seven-year, US$80-million contract extension, but the Rockies have a plethora of outfield options and have seemed to be in no rush to offer a new contract to their longtime star. 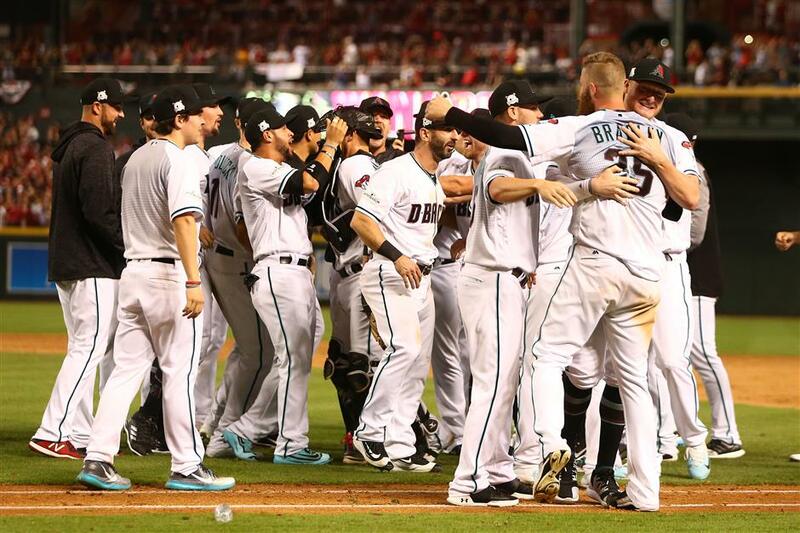 The Diamondbacks-Dodgers winner will face either Washington or the defending champions Chicago Cubs in the NL finals to decide a berth in the World Series. The American League playoffs continue on Thursday with Boston at Houston and the New York Yankees at Cleveland in the openers of their best-of-five matchups.